Are you struggling to select the best flooring material for an upcoming project? Relax – help is at hand! Read our concise comparison of polished concrete and resin flooring systems to make an informed decision about which floor is right for you. In the world of flooring, polished concrete is the new kid on the block, standing out from the crowd and moving up the popularity ladder and making friends quickly. In recent years, polished concrete’s popularity has soared due to improved grinding techniques that allow for the creation of more attractive finishes. Not only is it popular, it’s also adaptable to new environments and suitable for commercial and industrial facilities. Polished concrete has the ability to transform existing concrete slabs into visually appealing surfaces that are both durable and easily cleaned. Although polished concrete has achieved recent accolades in the industry and provided architects and designers with alternative flooring options, it doesn’t mean that it’s necessarily the best option for everyone – designers will need to weigh up the obvious attributes of polished concrete against the enhanced performing profile of A* student seamless resin. Seamless, resin based flooring materials can provide commercial spaces with greater durability, as well as lifecycle cost savings. Epoxy, polyurethane and methyl methacrylate (MMA) are three of the most common seamless resin materials. The seamless terrazzo range Mondéco, offers clients a wide variety of colourful and decorative aggregates to choose from, which are incorporated into the resin mix and later diamond ground, to deliver a smooth terrazzo floor finish. Whether your project is for the industrial, retail, leisure or hospitality sector, it’s important to remember that the finished surface should meet the required criteria for appearance and functionality, as well as the project’s budget and construction constraints. Therefore, understanding the benefits and disadvantages of each type of flooring is key to finding a particular facility’s flooring solution. Polished concrete is a concrete floor that has been chemically treated and ground down to a smooth, shiny surface with progressively finer diamonds. Polishing and grinding techniques are employed to achieve a super flat, super glossy finish that is durable, easy to clean and maintain alongside offering clients a lifecycle cost that is typically 60% less than traditional floor coverings. 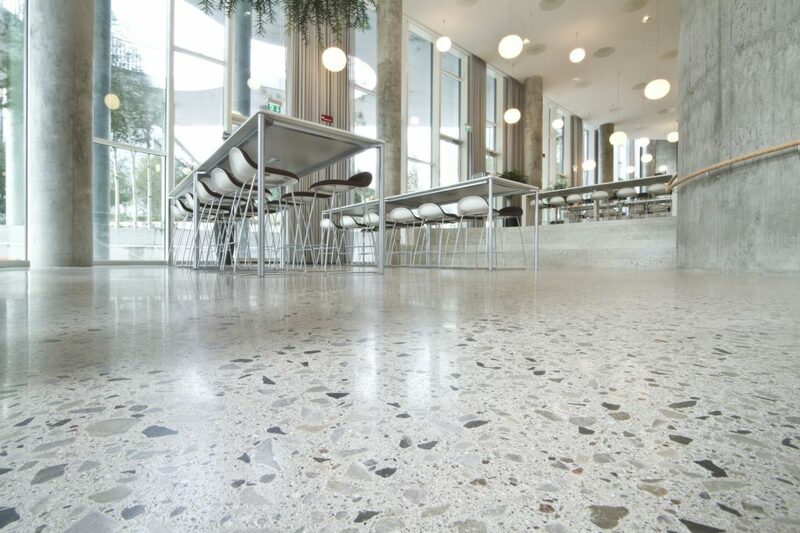 The hard-wearing properties of concrete mean that a polished concrete floor is robust and if well maintained can last for an extended period of time without getting scratched chipped, dented or otherwise deteriorating. It’s easy to sustain a hygienic environment with polished concrete, as it does not support mould growth and its low maintenance finish means that weekly washes with warm soapy water are all that are required for cleaning purposes, saving time, energy and effort, compared to floors that need waxes and sealers. Health associations have endorsed polished concrete floors, as they prevent the build up of allergens such as animal dander, dust and dust mites, all of which thrive in carpeting. Polished concrete is the more sustainable option when compared to concrete as it avoids the extra carbon footprint incurred by manufacturing, transporting and installing additional materials. The LEED standard even includes guidelines on how using polished concrete flooring can help qualify for LEED credits. The condition of the existing concrete is the key consideration when determining if polished concrete is a viable option. Certain problems such as cracks, delamination and dusting can be repaired, but if the substrate is too far gone, the concrete will either need to be replaced or have a special concrete overlay applied. If the concrete is of a good standard but with relatively poor level tolerances, then it will be more difficult to polish the surface, so additional labour and aggregate exposure would be required. Polished concrete floors are susceptible to moisture and need to be properly sealed on both the top and the bottom. If liquid does infiltrate the pores of the concrete, this could cause mould and mildew to grow and if the liquid freezes, could lead to serious cracking in the slab. Concrete expands and contracts during changes in temperature and these fluctuations are another potential cause of cracking. Cracks can be repaired with a waterproof sealant, resin application or cement overlay, however matching the colour and texture can prove very difficult. Peran SL is a colourful and self smoothing epoxy resin floor finish ideal for a minimalist contemporary environment. This eye-catching, joint free system is suitable for use in areas subjected to foot traffic, such as retail stores and restaurants. Epoxies boast a wide range of advantages that help to create a functional, hygienic and easy-to-maintain surface. Epoxy systems can be installed that are vapour permeable, low odour and cost effective with excellent dustproofing qualities. 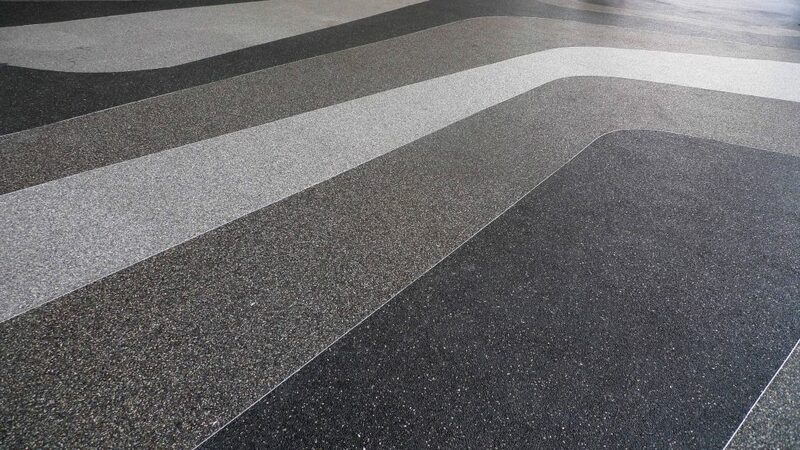 Epoxies offer a wide variety of colour options and decorative effects, which is best exemplified by the almost unlimited design potential of seamless resin terrazzo systems! Water based epoxy coatings at the thinnest end of the scale have a limited life span of two or three years and will need to be recoated after this time to maintain a viable surface. Epoxies generally have a slower cure rate compared to polyurethane and MMA floors. An epoxy system may require one or two seal coats to remove porosity. Polyurethanes tend to dominate the thicker, more robust end of the resin flooring spectrum. Depending on the system, polyurethanes can be installed as a flow applied, self-smoothing or trowel applied mortar. Rustik UV was chosen for Siwilai City Club in Bangkok due to its decorative stone carpet system which consists of light coloured natural stones encapsulated in a clear aliphatic, UV stable polyurethane resin, in order to produce a natural looking, attractive floor finish suitable for outdoor environments. The true benefit of a polyurethane finish lies in the exceptionally robust nature of this material. They hybrid chemistry of polyurethane concrete makes them an extremely hard-wearing and robust flooring option. Thanks to this durability, polyurethanes will maintain a seamless, impervious and easy to clean finish for an extended period of time. Polyurethanes are great at resisting rapid and extreme changes in temperature as well as seasonal thermal cycling without cracking. Some managers and architects can be put off by the cost of a polyurethane floor, however it is important to note that choosing a cheaper solution will usually mean installing a thinner or more aggregate filled system that won’t provide the same long-lasting properties. MMA systems get their name from the methyl methacrylate catalyst that is central to their formulation and which gives this material the following key benefits. The application versatility of this type of resin flooring has seen it become popular in a wide variety of market sectors. 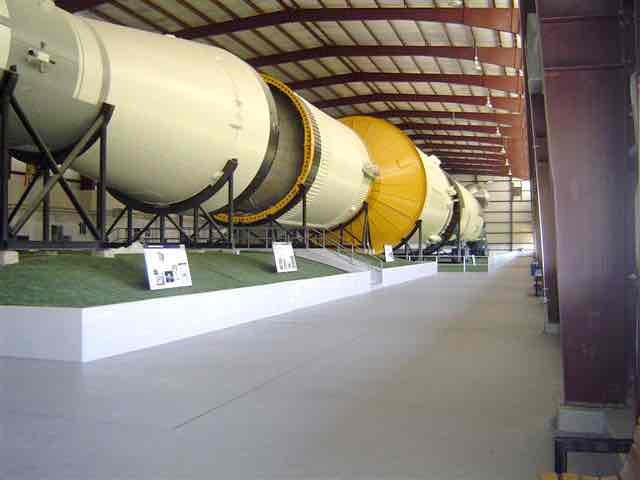 NASA used Flowcrete’s ‘two-hour flooring concept’ by installing Fast Cure MMA. This rapid curing system uses the latest resin technology to deliver a finished surface ready for use just two hours after application. MMA resin floors can fully cure in less than an hour and can be installed at extremely low temperatures. Both of these factors make it ideal for speeding up a construction schedule or for a flooring refurbishment project that needs a fast turn around. This type of floor can be installed on top of a wide variety of substrates including concrete, steel, tiles, marine ply and other resin materials. MMA systems exhibit incredible bond strength and high compressive strengths as well as a wide temperature range. The flooring exhibits a strong odour during installation, though it is harmless and disappears quickly. 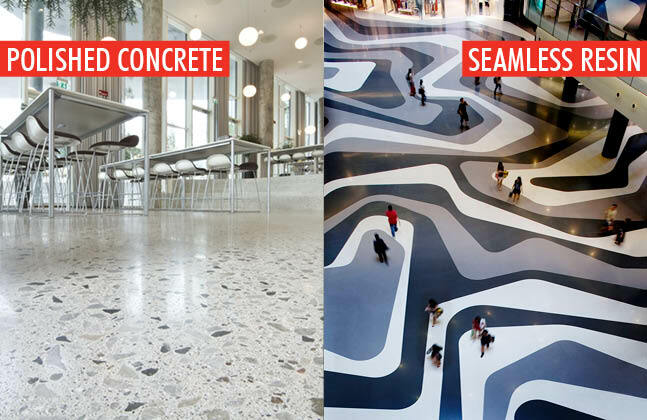 So – which team do you support – Popular Polished Concrete or Super Seamless Resin? To sum up: choosing polished concrete will remove the need to source and install extra material, however it also results in the site being subject to the quality of the substrate for the look, longevity and effectiveness of the flooring. In contrast, the type of material, thickness and functionality of a resin system can be adjusted to fully optimise the area. If you’d like to find out more about this topic, click here to download the whitepaper Comparing Polished Concrete and Resin Floor Options for Commercial Environments. It’s interesting that there are so many different types of concrete that go unnoticed in our everyday lives. Even without realizing it, there’s a lot of work that goes into the floors that we walk and stand on every day. I like that you list the pros and cons of each different type. I really like the more modern look of the vibrant resin flooring. Very cool information! Thank you Burt for your kind comments. We are pleased that you enjoyed the article and agree that resin flooring offers a number of different pros and cons – and can indeed look fabulous on the floor! I noticed your comments on resin floorings and was hoping you could point me in the correct direction. We would like a white (ish) resin floor that is durable, scratch/ crack and UV resistant to go on top of UFH. Thanks for your comment. There are a few options to create a white resin finish to sit on top of UFH (assuming the UFH is encased in a suitable screed that will bond with the resin coating). An aliphatic polyurethane coating is a good bet or there are epoxy resin terrazzo materials that will create nice white floors with an interesting aesthetic. Standard MMAs tend to have more of a flaked or dappled appearance and so may not achieve quote the look you’re after. 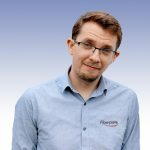 If you let us know where you’re based we can forward your query on to your local Flowcrete representative who will be able to talk you through the available options in more depth. I’m wondering if you might be able to help. We live in Italy and have paid an enormous amount of money for cocciopesto (which is baked terracotta, crushed and mixed with other materials, possibly cement I’m not sure. The romans used it apparently). In any case, the person who laid it didn’t know how and it’s ruined. It has cracks and holes everywhere and the fine speckly texture it’s supposed to have is just whitish powder now. We have now almost no money to fix it. That does sound like you’ve been landed in a tricky situation! As there’s quite a few factors going on here we’ve asked one of our technical wizards on this one and we’ll get in touch with his advice as soon as possible. Would polished concrete or a resin covered floor be best in a home basement that has had water problems? Hi Fran, thanks for your comment. Both resin flooring and polished concrete are susceptible to moisture issues unless the proper precautions are taken prior to installation so it’s difficult to recommend one over the other without knowing the specifics of the case. I’d recommend that you discuss both options with an applicator experienced with resin and polished concrete floors and make sure that the floor’s moisture level is thoroughly tested and that it conforms to the manufacturer’s recommended tolerance levels before anything is applied. I have heard of micro cement as an option for flooring and walls… but it seems to be more popular in Europe than here. Is it comparable to any resin system? Many thanks for your comments and enquiry. Yes, microcement is certainly becoming more and more popular, particularly in the residential market, with those looking for an industrial polished concrete aesthetic. Microcement is usually a thin coating (typically 2 – 3 mm) and has excellent bond strength so can be applied to almost any kind of stable substrate, including existing tiled floors. However, as the name would suggest, the product is cementitious rather than resin based. There are resin equivalents that offer the same kind of aesthetics, these are typically referred to as ‘comfort floors’ and offer a silky experience underfoot. These are aliphatic polyurethane coatings that are completely UV stable and will not yellow over time. These systems offer a durable, seamless and easy to clean surface that will withstand intensive foot traffic, rigorous cleaning as well as the scuffs, stains and scratches that the floor will face on a daily basis. These are used more often in commercial properties subject to a much higher footfall or traffic conditions. I hope this helps, but if you have further questions, please don’t hesitate to drop me a private email and I’ll put you in contact with one of our of Technical Advisors. Many thanks for your kind comment, great to hear that this post is of interest. Great article ever.Best write up.Very nicely written ,explaining everything in a detailed manner using pictures.Thanks for sharing this article.I am supposed to do install floor for my new shop and was confused about which floor type will be the best but your article solved my all query. Hi Jasmine. Many thanks for your comment and great to hear that the post helped you to choose your new shop floor. If you ever have any queries or questions on this topic don’t hesitate to get in touch. It got me when you said that the polished concrete type of flooring will be able to keep the allergens from building up. I guess I would have to choose this kind of floor for my garage because my son has asthma. We just discovered it last month when it got triggered by the carpet’s dirt. Thanks for the information! What would you recommend. I have worn out hexagonal quarry tiles in our laundry and instead of digging them up I would like a thin tough long lasting coating. The laundry butts up to our dining room which has a solid oak floor and they are separated by a door. The existing floor is sound and dry but has lost all the glaze. If you’re not planning on removing the tiles then the problem you might have here with a thin but tough paint or resin type system is making sure that it will bond to the substrate, as these types of systems may well delaminate, crack or flake away quite quickly when laid on top of tiles. One solution that’s used in industrial and commercial locations quite often in these types of scenarios would be to apply a methyl methacrylate (MMA) system, as they are really good at bonding to a wide variety of substrates. These are quite specialist systems, so it’d be worth getting in someone who’s been trained in how to apply them if you want to go down this route. In addition, if you do go for a paint, resin or MMA system, make sure that the grout lines have been properly filled in, as otherwise they could appear as lines in the finish once the coating has settled and cured. I didn’t know that concrete could offer such unique and gorgeous finishes for the floor. I really like how you mentioned how adaptable and suitable it is for many different environments. This really makes me want to look into it more and see if this is something I could install into my space. 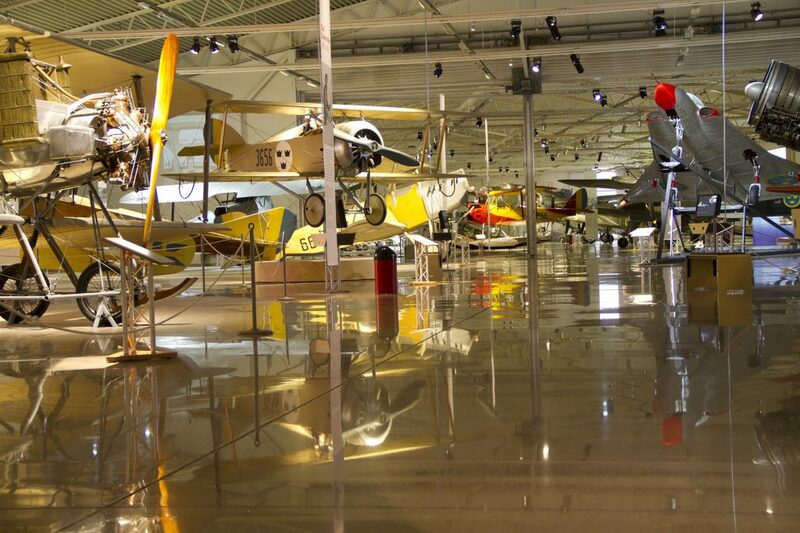 I was lucky to see Air Force Museum’s polished concrete personally in Malmslatt in the outskirts of Linkoping, Sweden. The floor looked in 2012 like new, after 2 years of the foot high traffic. Proper cleaning and maintenance of the polished concrete is the key! If I had to pick between all these types, I would probably go with the polished concrete. The main reason why is that it can last for a very long time, that is if you maintain it as you should with any floor. That and it is also low maintenance which means that I could easily clean it myself. Nice post. Thank you for sharing this informative post about polished concrete vs resin floors. It’s very useful. Looks great, do you guys sell terrazzo mix? I see it in one of the pictures? 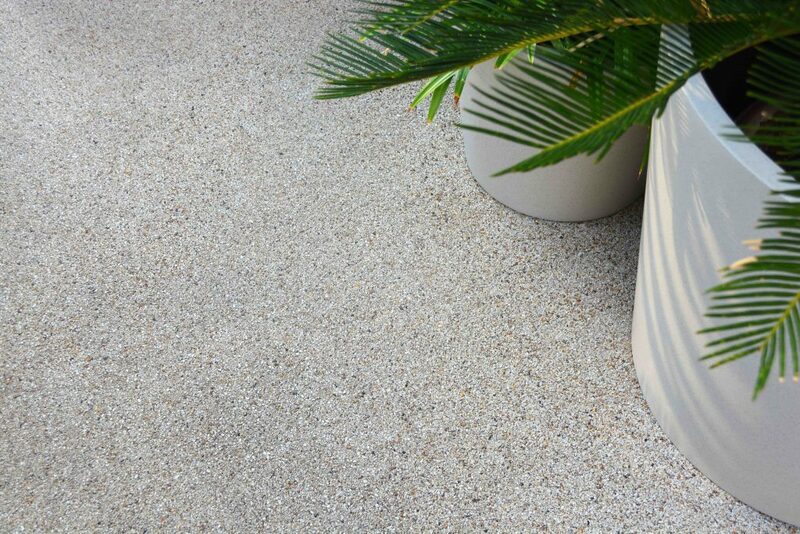 We do have a seamless resin terrazzo range. I’ll drop you an email about it with some more details. Hi, We are planning a seamless resin floor for our home. Can you recommend one type over another in terms of stain and scratch resistance? Will chair and table legs damage any of these materials? We’re thinking of going with MMA – how would this compare to polyurethane for example? Polyurethane is the most hard-wearing type of resin flooring, however it’s probably overkill for a residential project, as it’s designed with large industrial facilities in mind. Both epoxies and MMAs should provide sufficient stain and scratch resistance, although it’s important to know exactly what type of system is being applied as there are many different types and the use of additional elements such as sealers and scratch coatings can help to enhance a resin floor’s scratch resistance. If possible, ask if you can see a similar system in situ before deciding on the coating you’d like to use, as this is a great way to tell if the flooring build-up in question is up to the task at hand.